All Microsoft Office programs can check the spelling and grammar. You can check spelling and grammar all at once by running the spelling and grammar checker, or you can check spelling and grammar automatically and make corrections as you work. You can also turn the automatic spelling and grammar off if you'd like. 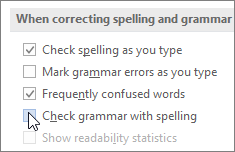 If you find that spelling or grammar checking isn't working as you'd expect see The spelling and grammar checker isn't working as expected. If you'd like to check spelling or grammar in a language other than your default language see Check spelling and grammar in a different language. Using Word 2016? You may be interested in checking out the powerful new Editor feature! See Editor - your writing assistant for more information. Open most Office programs, click the Review tab on the ribbon. In Access or InfoPath you can skip this step. Click Spelling or Spelling & Grammar. If the program finds spelling mistakes, a dialog box appears with the first misspelled word found by the spelling checker. After you decide how to resolve the misspelling (ignoring it, adding it to the program’s dictionary, or changing it), the program moves to the next misspelled word. Most Office programs automatically check for potential spelling and grammatical errors as you type, so you don't need to do anything to show errors while you work. Automatic grammar checking is available only in Outlook, Word, PowerPoint 2013, and PowerPoint 2016. If spelling or grammatical errors aren't marked, automatic checking might be turned off. You can turn on the automatic spelling and grammar checker. When you see a spelling or grammatical error that you want assistance fixing, right-click on the underlined word or phrase and choose one of the options to fix the error. If Office is flagging words as misspelled but you have it spelled the way you want it, select Add to Dictionary to teach Office not to flag that word as misspelled in the future. For more information on this see: Add or edit words in a spell check dictionary. In OneNote, PowerPoint, Publisher, Visio, and Word: On the File menu, click Options, and then click Proofing. In InfoPath: On the Home tab, click the arrow next to or under Spelling, and then click Spelling Options. In Outlook: On the File menu, click Options, and click Mail, and then click Spelling and Autocorrect. Select or clear the Check spelling as you type check box. In programs that have automatic grammar checking, you may also select or clear the Mark grammar errors as you type check box. 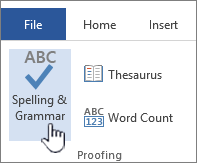 Note: In Word, you can turn the spelling checker on or off for the document you're working with or for all new documents. Select an option in the Exceptions for list, and then select or clear the Hide spelling errors in this document only and Hide grammar errors in this document only check boxes. 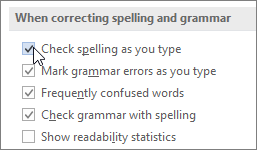 Clear the Mark grammar errors as you type and Check grammar with spelling check boxes. Note: Not every Office program will have both of these options. Open the document or item that you want to check. Click OK in the dialog box to get back to the document, and then run the spelling and grammar checker again. This article was last updated by Ben on February 26th, 2019. If you found it useful, and especially if you didn't, please use the feedback controls below to leave us some constructive suggestions as to how we can make it better.